Live beside where everything is happening, featuring some of the hottest destinations. Live at Concord Canada House a new preconstruction condo development by Concord Adex located at 23 Spadina Avenue in Toronto at CityPlace where Spadina Avenue meets Bremner Boulevard. The final 2 towers are finally here in this energetic, vibrant, diversified neighbourhood featuring shops, parks, pools, pedestrian/cycling paths and paths. Your style. Your neighbourhood. Your life. Skyscraping towers in a community that comes together, a place to live, a place to play, a place to hang with old and new friends. It's a place to get in shape and it's a place to cool off on a hot summer day. Feeling entertained, well no need to take the bus or subway or even take out your car and pay hefty parking tickets, every entertainment that you can think of is just within walking distance. Currently the site is occupied by the real estate developer's headquarters and impressive presentation centre, but it is to be replaced soon with a shinning pillars mixed-use condominium project containing two high-rises rising to 68 and 79 storeys from a 10-storey podium which will consist of retail, office, and residential dwelling units. Ground level of Concord Canada House will wrap approximately 25,000 square feet of restaurants and shops around the ground floor edges of the property, aiming to attract passersby with open and inviting spaces. The second storey of the podium (about 43,000 square feet) will be occupied by offices, followed by residences and a dougle-height amenity area which includes a basketball court and a cantilevered pool hovering above Spadina. The podium is topped off by an extensive manicured greenspace—25,000 square feet in size, exceedingly rare for a Downtown site—split over two levels, providing lots of outdoor recreation space including a dedicated area for dog lovers to exercise their pets. A pet spa will also be included as part of approximately 25,000 square feet of indoor amenity space. A total of 1,536 residential dwelling units and 724 parking spaces are proposed as part of this massive master-planned community in a prime real estate location. 107 bachelor units, 1132 one bedroom, 138 two bedrom and 159 three bedroom units. Units will be ranging from 530 - 735 square feet for the 1 bedrooms & 1 bath units. 1 bedroom plus dens will be ranging from 578 to 770 sq.ft. 2 bedrooms from 935 to 968 sq.ft and 3 bedrooms at1015 sq.ft. to Vehicular parking spaces will be also provided. Parking access to the buildings will be through an entrance on Blue Jays Way, just underneath the central glazed amenity spaces that cascade downwards and inwards from the rooftop recreational areas. Underground parking will be provided in the form of approximately 600 residential spaces and 115 visitor stalls. Car share parking spots are also being proposed. Seen from the Toronto Islands, the high-rise columns at this ambitious project will form two new peaks on the skyline to the west of the CN Tower. The crowns of each building, along with strips running up all corners of both skyscrapers will be reserved for artwork to enliven the exterior. One of the most recognizable features of the development is it's public art contribution. Traditionally, public art is situated on the ground, unattached to the podium. This proposal aims to integrate the art by running panels along each indented corner. The proposed artworks would travel from the podium to the mechanical section of both high-rise, making it visible not just from up close, but from across the city. These 2 pillars development are in the best real estate location that will bring plenty of new residents to the neighborhood to a community that knows this is the place to live. Ten percent of the total number of units will offer three bedrooms at about 900 square feet, while fifteen percent will be "barrier-free" to accommodate persons with disabilities. Five elevators will service all floors in each building, with separate elevators for the podium. Estimated completion date is set for 2019. Concord Canada House Condos will be located in Entertainment District where location means eveything in real estate. This area is concentrated around King Street West between University Avenue and Spadina Avenue.The Toronto Entertainment District is home to theatres and performing arts centres, four major-league sports teams, and an array of cultural and family attractions. The area is also home to most of the nightclubs in downtown core. The area holds some of the top attractions too. For the best views of the city, take a high-speed elevator to the top of the CN Tower. Or immerse yourself in the underwater world of Ripley’s Aquarium of Canada, which boasts 16,000 aquatic creatures from all around the world. When the big game is on – whether it's the Maple Leafs or the Raptors – the atmosphere around Air Canada Centre and Rogers Centre is supercharged. On non-game days, both venues offer an exciting roster of big-name concerts. When night falls the clubs in the district come alive with partiers from all over the dowtown area and beyond coming in to dance, see, be seen and just take in the scene. No matter what time of day or season, the Entertainment District is the home to something big. Register here today for more details on these New Shinning Towers! Concord Canada House is a new condo developmentin the CityPlace site. These 2 dramatic slender skyscrapers are located in the heart of Downtown. 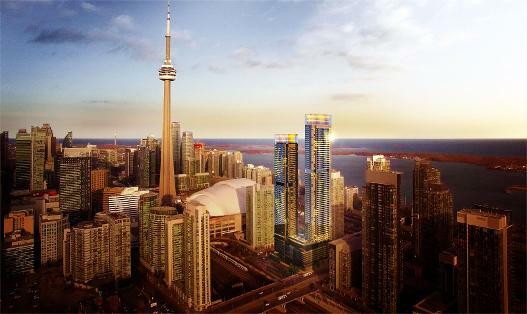 This incredible vision is the largest real estate residential development in Toronto. In 1997, Concord Adex was formed to oversee the growth and building of this 45-acre site. The neighbourhood will consist of 29 condominium structures in addition to the town homes, which will be home to 15,000 people. To date, 22 buildings have been completed or are under construction. When complete it will comprise of 5.4 million sq. ft. of residential and commercial space. The focal point of this site will be an $8-million, 8-acre park celebrating the history of Canada. All residences are complemented with an array of community amenities that include schools, childcare centres and fitness facilities, neighborhood shopping plus an impressive collection of public art. The presence of public art has the power to create and reinforce a sense of a place where everyone comes together, it also improves physical connections to the City by enhancing sight lines, streetscapes and urban dimensions. The master-planned community is all about art, with art consultant Karen Mills, has chosen a wide range of form and disciplines to inspire. Concord Adex a Canadian residential developer and real estate investment firm with focus on projects in Vancouver, British Columbia and Ontario. The company is based in Vancouver and is one of Canada's leading developers. Their major ventures is in the GTA former railway lands near the CN Tower. Once owned by Canadian National Railway, the railway property was acquired by Concord Pacific in the beginning in 1997. The proposal, now known as CityPlace. When completed, this area will be the largest residential development ever created in Toronto. The area is bordered by Bathurst St to the west, Lake Shore Boulevard to the south, and Front Street to the north and Blue Jays Way and the Rogers Centre to the east. This ambitious master-planned community is also a 5- to 10-minute walk from King Street West and Liberty Village and a 10- to 20-minute walk from the city's financial district. The neighborhood is also home to the Canoe Landing Park designed by famed Canadian writer and artist Douglas Coupland. Over the past 25 years, the company has also grown into other industry sectors including software and information technology, telecommunications, as well as green energy projects in solar, wind and hydroelectric power generation. What we can say and expect is that Concord Canada House Condos will be in demand and sell out in a couple of weeks. Register with us today for more information on these 2 high-rise buildings!